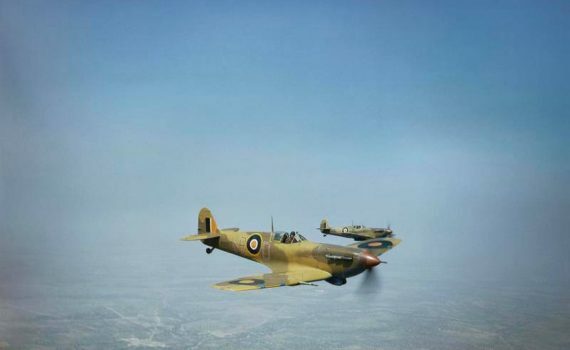 WW2 – Tunisian campaign 1943 – original colour photograph of two clipped-wing Supermarine Spitfire V’s of No 40 Squadron, South African Air Force serving in a reconnaissance role. ER622/`WR-D’ accompanied by `WR-C’ patrols over the Tunisian battle-front. Note the orange centre on the rondel and orange strip on the tail flash. The rondel and tail fin flash where in the national flag colours – the Union flag of South Africa, the oranje blanje blou (Orange, White, Blue). Of the British and Commonwealth forces serving in Tunisia the South African Air Force was the only to carry a different colour in the rondel centre, the British, Canadian, Australian and New Zealand air forces all had the RAF red centred rondel modelled on the United Kingdom’s ‘Union Jack’ colours of Red, White and Blue.